Acquisition of Asia Square Tower 2 (AST2) for S$2,094mn or S$2,689/psf. Translates to NPI yield of 3.6% based on committed occupancy of 88.7% for total NLA of 778,719 sq ft.
Total acquisition cost of S$2,151mn to be funded by 52% debt, 32% Rights offering, 16% internal cash from divestment proceeds. Pro forma DPU yield for 1H17 drops from 5.38% to 5.13%, but various NPI growth drivers exist for AST2. Maintain Accumulate with an unchanged DDM-derived target price of S$1.80. We recommend to subscribe to the rights issue. 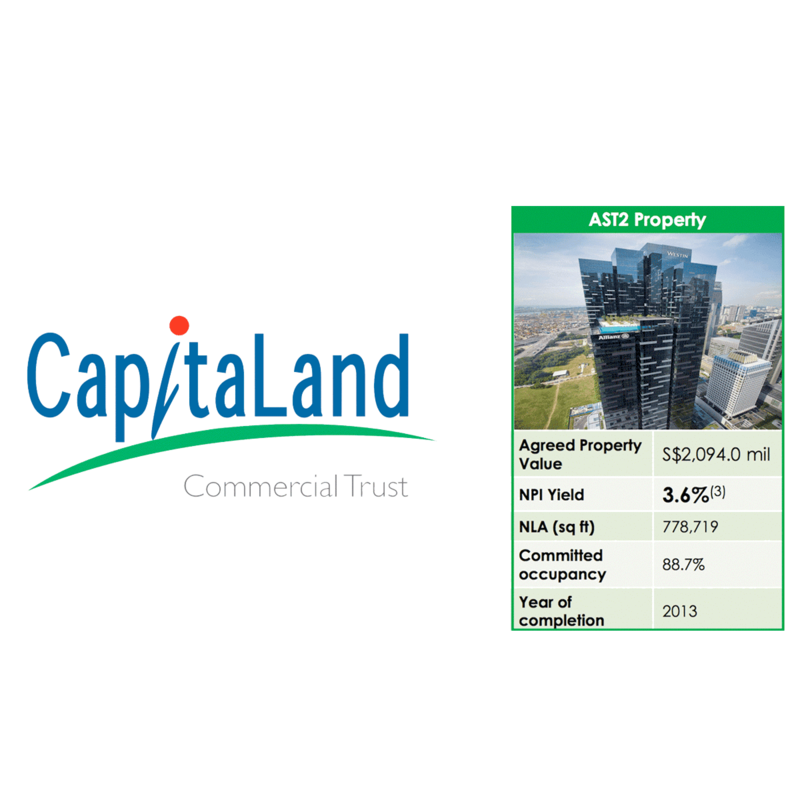 CapitaLand Commercial Trust (CCT) announced the acquisition of Asia Square Tower 2, a premium Grade A office building from BlackRock Asia Property Fund III L.P. for S$2,096mn or S$2,689/psf. Total Net Lettable Area for AST 2 includes 753k sqft of office space and 25.3k sq ft of retail space. Completed in 2013, remaining land tenure for AST2 stands at 89 years. To be partially funded by debt/rights issue/divestment proceeds, pro-forma aggregate leverage of CCT will increase from 36% to 37.1% post acquisition. Recycling capital into higher yield after recent divestments (3.2%-3.4% vs acquisition yield 3.6%). Recall CCT’s recent divestments of One George Street (50%, OGS) and Wilkie Edge at exit yields of 3.2% and 3.4% respectively. Partial divestment proceed is recycled into a higher yielding asset at 3.6% (assuming 2.5% interest cost), plus with a slightly longer land tenure (AST2’s 89 years vs OGS’s 85 years). NPI yield on cost could be further boosted as occupancy has room to grow from 88.7% currently. CCT’s strong network of corporate tenants has enabled it to keep up its average overall portfolio occupancy at 97.3% over the past decade. We are also confident of the Group’s ability to boost occupancy from current level, given the tapering of supply of office properties, especially in the Marina Bay submarket over the next 3 years, following the completion of Marina One this year. Acquisition price of S$2,689/psf is 7.3% lower than the average valuation of S$2,900/psf for 5 comparable Grade A office buildings in AST2’s vicinity (Marina Bay Financial Centres 1-3, One Raffles Quay and OUE Bayfront). All five buildings have remaining land tenures of 83-89 years, equal or less than AST2. Peak rental contracts signed in 2015 due for renewal next year. Reversions likely to be weak. But impact to be mitigated by low percentage of expiries in 2018 (10% of NLA), and a potential uplift in NPI from improving occupancies. We expect rental reversions to come in at negative high single digits in 2018. Nonetheless, we estimate that just a 1% improvement in occupancy level will be able to fully offset the decline in NPI from the expected negative reversion in 2018. We expect occupancy to improve to mid-90s % by FY18. Post-acquisition and rights issue, our FY17e/FY18e DPU forecasts are adjusted by - 4.6%/0%. Our target price of S$1.80 represents a P/NAV of 1.0x and FY18e yield of 5%.